I wanted to create something fall inspired because of all the beautiful trees in the park. I collected a bunch of pretty leaves in the park and therefore I decided to make a fall lantern that is made of just a marmalade jar and those leaves! 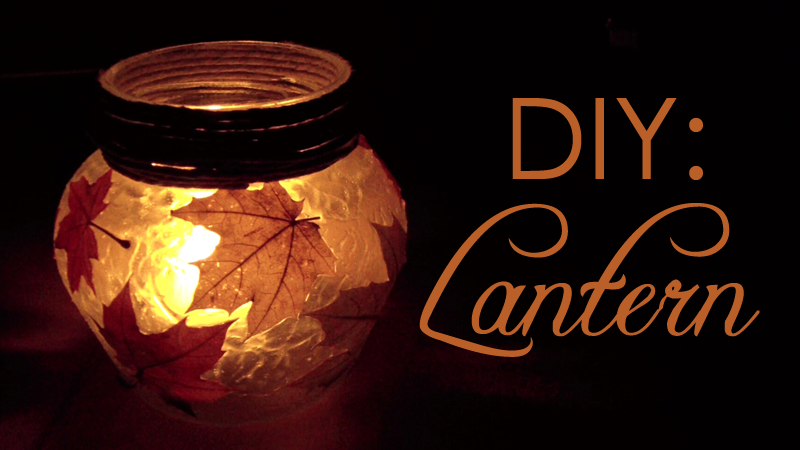 This is just an idea how you could create your own lantern. You can adjust the leaves how you want it and you don’t even have to use the string for the opening! Just experiment! I hope you enjoy this tutorial and if you have any questions, feel free to comment bellow! I love it, and what a nice video you made! I live in the desert in Arizona with no leaves. Maybe I can use some of the artificial ones that are in stores right now?? Love your lantern! It is very pretty. I love anything that has to do with leaves. Thank you for sharing your wonderful project. Thank you all so much! I'm glad you like it! @Sandy: You can use everything for this technique. If you find some artificial leaves, why not give it a try! Hi Mako! Just saw a glass Christmas ball ornament done very similar to this in Better Homes & Gardens Christmas From The Heart Volume 14 book. They used artificial fall color oak leaves and decoupaged them on the outside. On the inside they put clear mini glass marbles and tied a satin ribbon on it for hanging. They call their version Frosted Fallen Leaves and it is very pretty. I'm going to have to give this a try…very quick and lovely but easy and inexpensive. Thank you for sharing your version. Thank you, it is beautiful!